Attachment is a special case of our participation in the social engagement system — a VERY special case, as we will discuss next week. Barbara will be teaching us about attachment theory, assessment of attachment status, and the implications of a person’s early attachment history for her/his participation in relationships throughout the life span. She has provided some readings to help us prepare: assessment templates for attachment status of children and adults (in Hebrew), and articles by Bowlby (1960) on grief and mourning in infancy and early childhood; Cassidy & Mohr (2011) on the impact of disorganized attachment across the lifespan; and Slade (2005) on parental reflection functioning. In the meantime, additional resources will be forthcoming soon on today’s discussion: the dance of relationship, attuned/contingent communication, and the social engagement system. In this session, we looked in depth at dimensions of temperament, to see how we would structure therapy differently depending on the traits we see in our client — whether a child, adolescent, or adult. In adolescents and adults, characteristic ways of interacting with the world are usually labeled as part of personality, whereas temperament is the term used when referring to these characteristics in children. When we speak of temperament, we’re highlighting the inborn nature of how a person characteristically participates in interactions with the world. When we speak of personality, we’re making room for the impact of life experience and the self-organizing nature of the psyche, in combination with what was present at birth. We saw that extreme variations in dimensions of temperament can constitute risk factors — elements of a person’s situation that pose challenges to healthy development. Risk factors can be either internal (such as extremes of temperament, neurological vulnerabilities, genetic loading for certain forms of psychopathology, to give just a few examples) or external (such as family discord/violence, poverty, exposure to trauma, and so on). A person with a pronounced preference for one pole of a given dimension of temperament (for instance, extremely high or low regularity/predictability; extremely high approach to or withdrawal from novel stimuli; extremely strong tendency to positive or negative mood) may be at a disadvantage as they confront the complexity of human experience. This disadvantage is a risk factor that we, as therapists, will try to offset in how we structure therapy sessions, develop our therapeutic relationship, and devise interventions to move the work along. In the language of resilience theory, we are setting out to marshall protective factors that can offset the risk factors, thereby building the capacity for resilience in this person’s development. The article from the New York Times Magazine that Marci mentioned — the story of two sisters who responded quite differently to difficult early experiences, reflecting specific inborn (including genetic) factors — can be found here. This is one instance in which we can best make sense of the case material by using the concepts of temperament and resilience together. Resilience — the individual’s ability to meet developmental milestones even in the face of significant adversity — depends on the relative balance between risk and protective factors. Some dimensions of temperament constitute risk factors for a person; some constitute protective factors. Some of our characteristics make for difficulties in living, some help resolve difficulties in living — and some promote healthy living and flourishing! These internal factors are not all that define resilience, but they are among the critical dimensions that play a part. A good overview of resilience and its sources can be found in the work of Emmy Werner, including this four-page summary of the Kauai study. If you have only a few minutes to invest in additional reading on this topic, make this your top choice! Whenever we talk about resilience throughout the year, it’s Werner’s insights and findings to which we’ll be referring. You might also be interested in researcher Ann Masten’s description of resilience as “ordinary magic,” and resources on resilience that can be found on the site of the Israel Center for the Treatment of Psychotrauma. We talked about the therapist’s role in promoting resilience in a client’s life. Some dimensions of resilience are internal to the individual — attitudes and beliefs, personality and its expression, behavioral repertoire, interpersonal patterns, and capacities such as self-reflection and the ability to make and follow through with choices are a few that come to mind. In our therapeutic work, there is no doubt that part of our effort will go into supporting resilience at the individual level — both to reduce the impact of risk factors, and to enhance the effectiveness of protective factors. Additionally, as therapists we work to help the client marshall critical external resources from the family, social network, and community. These contribute significantly to resilience, a quality that does not reside “within” the person, but in the profound synergy of the person and her/his world that comes with the human condition. Think of all the sources of help that might play a part in supporting a person’s healing and growth, and the role we can play in making those connections! Referral to other professionals or self-help resources, encouraging the search for companionship and friendship in the family and/or community, supporting the client’s exploration of new directions to develop talents and skills . . . the list goes on and on. In the language of resilience, we can think of our therapeutic work as being a resource in the client’s life, as orchestrating resources available in the client’s world, and as helping the client cultivate the resources to be found within her/himself. That’s a powerful map of intervention strategies from which we can draw! Today we looked at a number of the realities present at birth. These are the factors — both within and around the individual — that give rise to individual differences among us. Think of life as a journey. All of us, embarking on the journey, come to terms with the human condition — ineluctable dimensions of life in this world that we share in common. We talked about some of those dimensions: that we are embodied, that we have an inner world, and that our nature is social. Another feature of the human condition is that in our lives, from beginning to end, we are involved with intentionality and goal-seeking, and the creation of meaning that gives shape and substance to our exercise of self-agency. In addition to the commonalities, we have individual differences in where we start our journey, and who we are as we begin. It’s easy to see that we all start from different places, and that our journey will be influenced by our social ecology: we’re born into different historical times and geopolitical locations, different social/cultural/sub-cultural contexts, different local communities, and different families of origin that include different individuals with whom we will form unique relationships. At the same time, we’re born with a set of characteristics reflecting the history of our prenatal (gestational) and perinatal (birth process) experiences, and our genetic endowment. Almost all the traits of interest in human development are polygenic in origin — dependent on the joint operation of many different elements of the genetic code — and genes’ influence is probabilistic rather than deterministic. The expression of our genetic endowment is the outcome of a complex series of transactions between the individual and the world, or G X E: genes interacting with environment. The study of this process is called behavioral genetics. These sites will introduce you to key concepts in the field. One more step, and we’ll be ready to look at temperament, the relatively enduring set of characteristics with which we begin life’s journey. Variations in temperament, present at birth, reflect the influence of genetic, prenatal, and perinatal factors, and represent individual differences in how each nervous system responds to environmental stimulation. Genetic sources of temperament exert their influence by shaping important properties of the nervous system — the “initial architecture” to which Gary Marcus refers — as described in this brief overview. So when we look at dimensions of temperament described by researchers — whether nine dimensions, three, or five — we’re seeing the individual’s nervous system in action, with its specific, characteristic patterns of reactivity. There will be some degree of change in those patterns as a result of experience, since the nervous system is plastic; yet since a person’s temperament both affects the environment and shapes the person’s experience of environmental events and conditions, characteristic patterns may persist over a range of experiences. Wachs (2006) gives a detailed analysis of this interaction, and Kagan (2009) discusses stability and change in one temperament dimension that has been the focus of his research. A recent analysis depicts the mutual influences of genetic endowment, nervous system reactivity, environmental events and conditions, and behavior. No simple one-way lines of causality here! Hyde, Bodgan, & Hariri (2011). 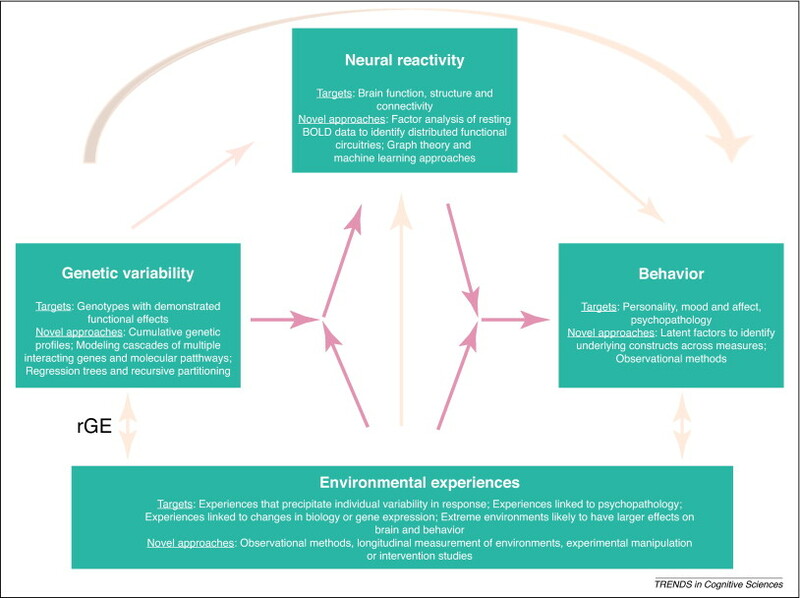 Understanding risk for psychopathology through imaging gene-environment interactions. Tr.Cog.Sci., 25, 423. At our next session, we’ll spend some time with the handout, and then progress to our discussion of resilience in human development. More on that later! And between now and then . 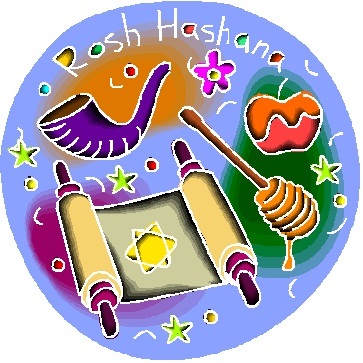 . . shanah tovah u’metukah! Who knew that every organ in our body operates on its own internal time clock, with the totality of the body’s organ systems synchronized by a “master pacemaker” in the anterior hypothalamus, linking our internal rhythms with events and conditions in the surrounding environment? Our bodies participate in an ongoing dance with the rest of the world. Some cells (sensory receptors) bring new information about what’s happening outside, and all cells communicate back and forth among and within themselves, continually. Not only neurons, but heart cells, hair cells, red blood cells — every tiny part of us is busily sending and receiving signals, organizing itself internally and integrating with everything around it. We become entrained with the larger rhythms that shape our world, whether we mean to or not. “Circadian rhythm” is the orderly sequence through which our body temperature, metabolism, and states of consciousness fluctuate throughout each 24-hour period, in sync with the coming and going of sunlight in our immediate environment. The circadian clock coordinates all the bodily processes that maintain vitality, health, growth, and capability for reproduction. 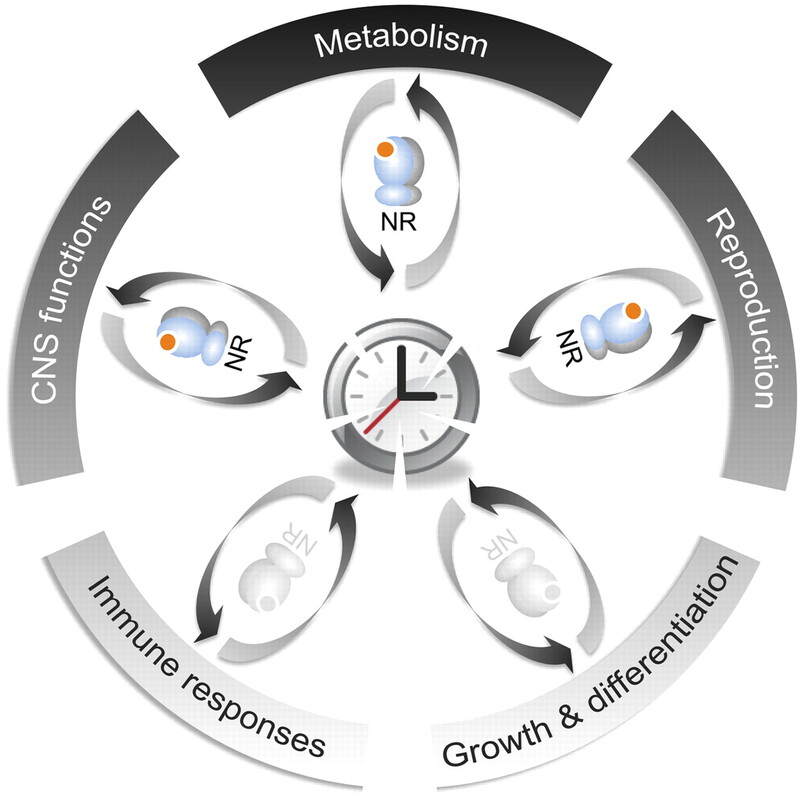 Graphic from Xiaoyong Yang (2010), A wheel of time: the circadian clock, nuclear receptors, and physiology. Genes & Development, 24, 741-747. You can map out your body’s predictable daily ups and downs with this online “Daily Rhythm Test” from the BBC. (Patterns of energy abundance throughout the day vary for the morning people and the evening people among us.) And you can learn more about cell signalling, the technical term for communication within and between cells, in an online tutorial available here. BTW, we’re not the only ones. All living beings — plants, animals of the land, sea, and air, and even Neurospora crassa (bread mold!) — share a “master clock” mechanism by which they tune into the daily cycles of time. Like us, they align their rhythms with the larger processes in which they are embedded, maintaining the dynamic homeostasis that supports life. It’s this intricate system that’s disrupted when we cross time zones: our body is still expecting the sun to rise and set when it did in the place of origin, and has to adjust to the timing that’s in effect in the place of arrival. Information about incident light enters through the eyes, and all our organs scramble to synchronize with the new schedule, and with each other. The problem is that some (such as the adrenal glands) are at the front of the line, while others lag far behind. Get with the program, guys! There now. Even jet lag takes a back seat to contemplating the wonders of creation. In our study of child and adolescent development in family context, we’ll see many examples of the lifelong interplay between discernible attributes of the individual (subjectively experienced as, in Winnicott’s words, a sense of “going on being”), and the equally objective reality of the environmental context in which humans are created, live, and grow. Two faces of the human condition present themselves to us: the person-as-himself/herself, and the person-with-others. We might be tempted to call this duality a paradox, as if the reality of what we are is either one way, or another. It’s more helpful to say that the two visions of human reality are complementary — to move beyond the world of either/or, and into the world of both/and. We have reality as beings in our own right. AND the beings we are always manifest in a relational context. Barbara has provided notes on assessment, development of the self system, and additional references in the Family Institute Library, as well as articles by Emery et al 1992, Hawley & Weisz 2003, and Sanders & Morawska 2005. Read and enjoy! Each semester’s Developmental courses start with questions: “Who develops?,” “What develops?,” and “How does development happen?” The questions are profound, for me, and with every class the answers feel different — even if the lectures sound remarkably similar. Almost 50 years later, Dad’s workbench fails to capture what we know or imagine about the complex mechanisms underlying memory and cognition. In 2011, we’ve moved from the workbench to the multidimensional heuristic workspace (Schroeder, 2003), and for the tech-minded, the holographic lab environment. Hey, the world within is way more cool than Dad’s workbench! Pascual-Leone, J. (1990). Reflections on life-span intelligence, consciousness, and ego development. In C. N. Alexander & E. J. Langer (Eds. ), Higher stages of human development (258 – 285). New York, N.Y.: Oxford University Press. Roediger, H. (1979). Implicit and explicit memory models. Bulletin of the Psychonomic Society, 13, 339-342. Welcome, to all of you with whom I have had the pleasure of learning, and those of you with whom I am about to start learning -- welcome aboard! This blog is about everything I'm discovering in my continuing study of Psychology, the field that never sleeps, and everything you're learning or would like to learn. So many really, really interesting ideas are coming up in the field. Let's share what we know and what we need to know! Don't be shy. You're welcome to make comments or raise questions here on the blog, or write to me separately if that's best for you.